At Falcon Windows we’ve been installing conservatories in Ipswich, Felixstowe, Stowmarket, Hadleigh, Woodbridge, Capel St Mary, Needham market and Suffolk since 1984 – now that’s a long time spent turning homeowners’ dreams into reality! We offer a comprehensive collection of PVC-u and aluminium conservatories and orangeries available in an extensive range of styles. These include Edwardian conservatories, Victorian conservatories, Georgian conservatories, gable-ended conservatories, lean-to conservatories and P-shaped conservatories. Our installation solutions include the latest innovations in conservatory and orangery design and incorporate robust and lightweight roofing systems, plus the very best in highly developed glazing technology and a great range of stylish finishes. The result is simply a new conservatory will add valuable living space to your property and enhance your home all year round. With ‘clima control’ glass in your vertical panels and self-cleaning aqua, blue or clear units in your roof, you can enjoy your conservatory for so much longer – gone are the days when conservatories were far too hot in the summer and much too chilly in the winter. And with new 'warm' roof technologies, you can easily turn your existing or new conservatory into a cosy, year-round garden room with a wonderfully well-insulated solid 'tiled' or 'slate'roof. The conservatory roofing system fitted by Falcon Windows is highly respected as the best on the market. By fitting quality products from leading manufacturers, we can be sure that your new living environment will not only be leak-free, but deliver that real feeling of space and all-important wow factor. All our conservatory products, fittings and components have been selected especially by our experienced team to be long-lasting and high-performers in terms of security. What’s our installation teams are fully trained to create conservatories to your specific requirements with the highest standards of care, workmanship and attention to detail. Whether you’re looking for an orangery or a truly bespoke conservatory design or simply a standard conservatory style from our wide selection of popular options, you can be sure that Falcon Windows will deliver real value for money. We supply and install conservatories for homes in Felixstowe, Stowmarket, Hadleigh, Woodbridge, Capel St Mary, Needham market and Saxmundham and offer straight-talking advice based on over 30 years’ experience and free, no obligation quotations. For further information, please contact the Falcon Windows team. Interested in a conservatory for your home? Structures are considered to be conservatories as long as 50% or more of the wall and roof area is glazed. For this reason, they don’t usually require planning permission or building regulations approval. There are exceptions and these are generally when the conservatory is in front of the building line, exceeds the permitted volume allowed for expansion of the property or if the property is in an area of outstanding natural beauty (national parks etc). As long as none of those apply and the area to be glazed is at least 50% of the total, it is possible to easily achieve a home extension which will even offer so much more than just a simple sunroom. An orangery from Falcon Windows in Ipswich Suffolk is a good example of such a conservatory solution. With brick piers and internal boxed lighting, an orangery is in a class all of its own, giving a lovely airy feel to an extension especially if you have the roof lanterns installed with self-cleaning aqua or active blue low-E planitherm double glazed sealed units. At Falcon Windows, we repair all types of leaking conservatories - whether the rain is coming in from the glazing bars or from where the conservatory meets the wall. Over our three decades in the home improvement business, Falcon Windows has often come to the rescue when regrettably people find that their conservatory company has gone out of business and the guarantee is not worth the paper it has been written on. 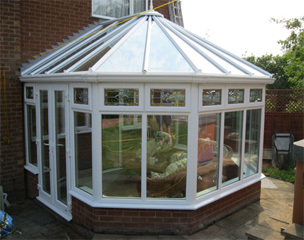 We give free quotations on leaking conservatories in Ipswich, Felixstowe, Woodbridge, Hadleigh, Stowmarket and Suffolk. Sometimes a leaking conservatory can be an easy issue to rectify and at Falcon Windows, we will take the time to advise our customers the most economical way of overcoming the problem, be it a basic sealing job, a need for complete replacement of the polycarbonate or replacement of the roofing structure itself. Conservatories are a cost-effective way to extend your home, particularly if moving isn’t an option. We can overcome most potential issues to enable your build to take place and offer a planning application service to help you with this aspect of the project if required. At Falcon Windows we have certainly seen different trends in conservatory and porch requirements over our thirty years in the home improvements business. Conservatories make an ideal relaxation space - the place to relax in after a hard day's work or to read the papers at the weekend. It brings the garden into the house, enabling you to enjoy your garden anytime of the year without even going outside. 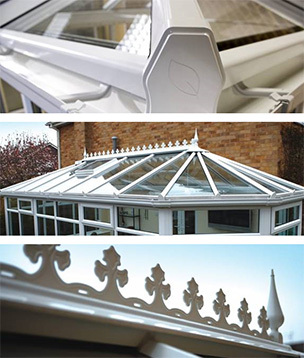 At Falcon Windows Ltd, conservatories are built to a high standard and can come in all shapes and sizes. We use the Ultraframe conservatory roofing system - one of the premier roofs on the market today, used by many double glazing companies in the UK. The windows in our conservatories are reinforced to a high standard. They have 70mm frame thickness with attractive Scotia beading, co-extruded low line gaskets, internally glazed, shoot bolt locking and anti jemmy bolts to opening windows, hook locks to all doors and restrictors fitted to all opening outwards French doors. There is a choice of having a dwarf wall (either 450 or 600mm high) which is the most popular option, full height frames or even 3/4 height walls with skylight frames - for extra privacy from your neighbour’s garden or perhaps to hide an unattractive fence. Some of our customers have even installed cosy lighting or flat screen TVs on the insides of the walls. Prices start from £4,895 Inc VAT and if, as in the majority of cases, no planning is required, it’s possible to install the conservatory of your dreams within 4-5 weeks from quotation, including all the groundworks. 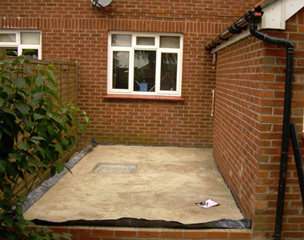 We do offer a planning service if that is needed, generally costing £350 to £400. We offer cost-effective conservatories in Ipswich and Suffolk and also provide additional quotations for laminate flooring, tiled floors, electrics, plumbing including heated flooring and blinds if you so wish. All our quotations are very detailed and drawn in colour. We upload your required conservatory onto an image of the back of your house, so you can really get an idea of what your conservatory will look like before it's even built. We operate on a fixed priced contract basis, so you will know exactly what you are paying for prior to the commencement of the work. We have our own ground working teams, specialist installation teams and qualified electricians, plumbers and finishers. Should any boilers or radiators need to be moved, we would only use qualified Corgi Registered plumbers. What’s more, whatever your conservatory choice from Falcon Windows, you can rest assured that every detail is covered by our own 10-year comprehensive warranty. A conservatory is probably the most underrated home improvement that you can possibly make to your home. Whether you want a conservatory for a garden room, breakfast room, playroom or even an office, you'll soon come to realise that it is truly a room for all seasons and you'll probably wonder how you ever lived without it. As with any investment, you’ll want to carefully consider all the options available - all conservatories are different, though superficially it may not seem that way. At Falcon Windows, we respect that you always have a choice. We consider ourselves experts who are here to help. We will provide you with the information you need and a free no obligation quotation, but we will never pressure you for a decision and will always leave you to make your own mind up in the time you need to make your decision. Adding a conservatory to your home not only gives you more space, but also opens up your house to the outside world, bringing your home to life in a way nothing else can. Natural light, sunshine and constantly changing scenery act as a magnet to young and old. 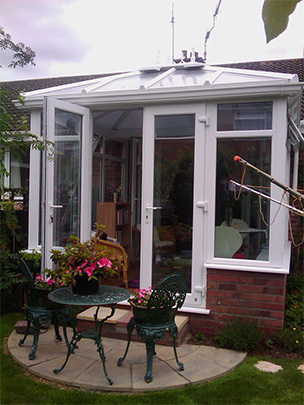 We think that you’ll soon find that a conservatory will rapidly become one of the most popular rooms in your home. There are numerous glass designs available for our conservatories. Some of the most popular are coloured fan light designs and bevelled designs that add an elegance to the building. We also offer a number of different Georgian Bar arched templated designs that also give a very stylish look. Our leaded designs can also be incorporated around the edge of the French doors if required, or will look attractive selected for the opening fanlights. Each Falcon conservatory comes complete with basework (including insulation, damp proof course and a screed cement floor ready for tiling, carpet or laminated flooring). Dwarf walls have a brick face or a plastered finish inside and are insulated as standard. Our heavy duty internal window boards come in white, light oak and rosewood finishes. Interested in having your conservatory or garden room fitted with blinds for privacy or shade, but want to avoid clumsy and high-maintanence venetian blinds? Our Sunshade integral Venetian blind systems see the blinds incased in the sealed window units. The blinds are easily operated, unobstrusive and very low on maintenance. Find out more about integral blinds from Falcon Windows here. 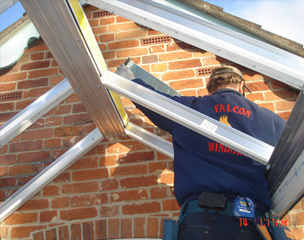 Part of the Falcon Group, Ipswich Trade Frames is a sister company operated to the same exacting standards as Falcon Windows but serving trade customers and self-build customers. 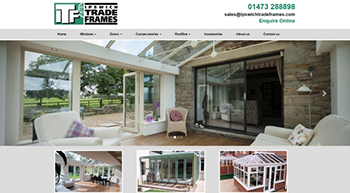 Under the guiding hand of Jordan Sheppard, Ipswich Trade Frames specialises in the supply only of PVC-u trade frames and conservatories to tradesmen and DIY build customers. For a conservatory quotation or to inform the Ipswich Trade Frames team of your requirements, contact Jordan and you will have a written quotation returned within 24 hours. 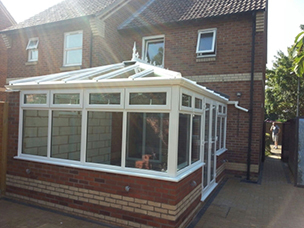 Trade conservatories in Ipswich have become more popular over recent years as some of our customers have wanted to save money and install them themselves. Jordan has had many a compliment on how professionally he runs this side of the business, giving excellent written quotations. 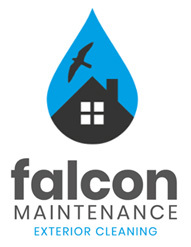 If you have a leaking conservatory, then Falcon can help too. Our Falcon Maintenance team is here to help. 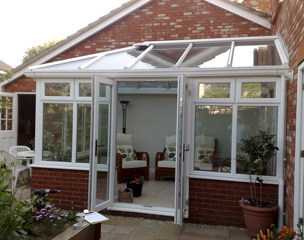 We can replace broken or misted units in your conservatory at very competitive rates. Renewing crest and finials on your roof or just replace the old one for a new minimal look. Replacement of handles and locks. Fed up with a cold & noisy conservatory? Replacing thin 16mm polycarbonate roof panels with either 25mm or 35mm polycarbonate will hold in more heat in the cooler months and make for a cooler conservatory in the summer. Why not take advantage of our no obligation, free inspection? We offer a free inspection and quote in Suffolk, so there’s really no reason to leave your leaks until they get too bad and potentially cause more damage to your property! Conservatory roofs can become very dirty over time and they can be very difficult to clean for the average householder. With our specialist access equipment and cleaning materials we can bring your conservatory back to life. We can offer anything from a basic roof wash, to a full valet and polishing service. Inside or out, you will be amazed at the results. Are you thinking of adding a conservatory to your property? Now is a great time to build a new conservatory. Think of all that extra living space – room to relax or share with the family; somewhere to enjoy the garden without even stepping outside. There are many types of conservatories to choose from, but you’ll want to choose one which is in keeping with your property and make sure that its size does not override the size of your garden. Despite glass roofs and innovative solid ‘warm’ roofs being more expensive than polycarbonate options, they are very much more in demand these days. Glass is quieter when it rains than polycarbonate; it has cleaner looks for more of a sky view and it is superior in terms of thermal efficiency. We also install clima control sealed units in the vertical panels which make the conservatory into useable space all year round. Our special coated films on our units prevent much of the hot sun gaining entry into the conservatory, making the room a cooler environment in the hot summer months. A friendly & reliable conservatory gutter & conservatory roof repair service. 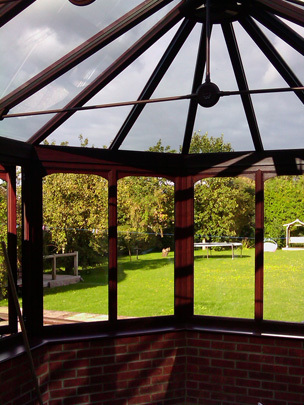 Each leaking conservatory or conservatory boxed roof repaired in Ipswich uses the best available materials. All repair work undertaken is fully guaranteed for your peace of mind.